Other Products by Fusion Health. 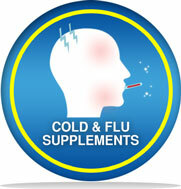 Search other Immune Boosters products. Fusion Health ActiViral™ is high potency formula to designed to help the body fight viral infections such as cold and flu. ActiViral is also effective in the management of mild upper respiratory infections such sinusitis, laryngitis and tonsillitis. Fusion Health ActiViral™ provides therapeutic or corrective doses of Andographis and Olive Leaf, both standardised to contain their active constituents Andrographolide 62.5mg and Oleuropein 30mg. Andographis paniculata, or sometimes called the King of Bitters has been shown in clincal studies to reduce the risk of contracting the cold virus, or if the virus is contracted to reduce the duration of symptoms. 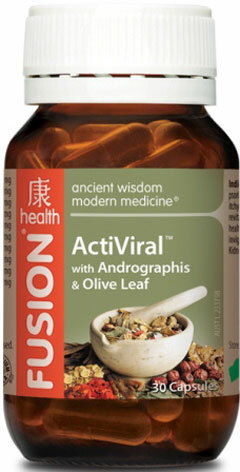 These two potent Antiviral herbs are combined with the immune-boosting herbs Echinacea and Honeysuckle. Fusion Health ActiViral has been further enhanced with the immune-boosting nutrients Vitamin C and Zinc Gluconate. Cold, flu or mild upper respiratory infections such as sinusitis, laryngitis and tonsillitis, mild gastroenteritis, cystitis and cold sores. ActiViral should be taken at the first sign of symptoms i.e. fever, congestion or sore throat. Take 2 capsules once or twice daily. Child 6 - 12 years: Take 1 capusle of ActiViral once or twice daily. Child 2 - 6 years: Take ½ capsule once or twice daily. Mix capsule contents with a little syrup or honey. For all ages, an extra dose of Fusion Health ActiViral may be taken to enhance results or as professionally prescribed.